No, not the Rodney Dangerfield movie, although I think I saw at least one member of the Vancouver Canucks perform a Triple Lindy last night (and if you understand that hockey reference, I should probably just go ahead and make you an admin of the site). The kids returned to school this morning after a 10-day spring break, and there was a certain sadness in our house last night and this morning. But the sadness had nothing to do with autism, or even NHL playoff results, the two most likely causes. Rather, we were all feeling a little down because this break had been so enjoyable for everyone. Spring break has always been tricky with Ryan, as it is for many kids on the spectrum. The loss of routine and daily structure can cause all sorts of problems. But this year was different. Veronica took the kids to visit her sister for the first few days, and they all had a wonderful time. Ryan even chose to leave his Hockey Guys behind because he didn’t think he could control his volume (he typically shouts while recreating the play-by-play) — a rather remarkable moment of self-awareness for him. Aunt Mary also has a dog, which a few years ago was a non-starter for Ryan, his fear was so great. But he has learned to tolerate dogs, at least familiar ones, to the point that he can stay in the same house with one. Ryan still spent plenty of time typing hockey standings on his laptop, but he also played street hockey against everyone in the family. By mid-week we were all together again back home, just in time for the start of the Stanley Cup Playoffs. Ryan chose to stay up past bedtime to watch his Sharks, something he never does. He celebrated appropriately when they won Game 1 and didn’t overreact when they lost Game 2. 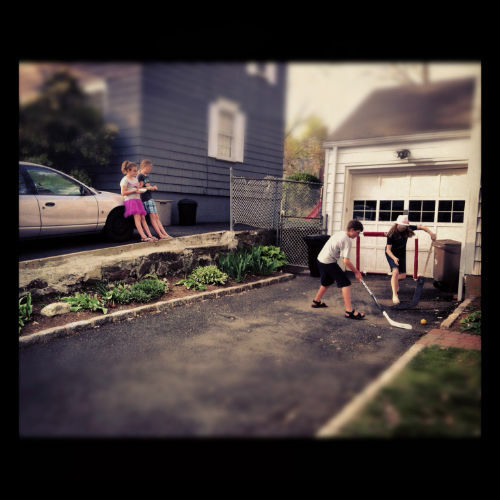 In between watching tons of hockey this weekend, we also spent a lot of time playing street hockey in the driveway. Normally this ends up being Ryan against parent, mostly because Riley and the neighborhood kids get tired of the extremely precise rules he imposes on every game. But yesterday, when my shins couldn’t take any more punishment (and I wanted to sneak back inside to watch the Penguins-Flyers mayhem in Philadelphia) Ryan was able to amuse himself either by practicing the shooting techniques I had shown him or engaging Riley and our neighbor’s kids. At one point, the four of them sounded like they were having so much fun I just had to step outside and see what was going on. Yeah, I gave it the Instagram treatment. This is what I saw: normalcy. Kids playing without needing parental intervention every five minutes. It’s true that this was only possible because the game was Ryan’s favorite, but this is still enormous progress. The best part? As soon as his sister or the other kids wanted to play, Ryan quickly chose to play with them instead of me. Don’t get me wrong — I love playing with him and I love that he wants to play with me. But that joy has always been tempered by knowing that if Veronica or I didn’t play with him, nobody would. As rejections go, I’ll take this one pretty easily. This has been a very challenging year in a lot of ways. Last summer and fall, we saw a child that was increasingly unhappy. That led us to seek extra help, including trying medication for the first time. Months of frustrating trials followed before we finally found a medication that he could tolerate and which seems to help focus him. Managing Ryan through each day still requires plenty of negotiation. Episodes of difficult behavior still occur. But we are coming off 10 days of unstructured activity in which the primary emotion was happiness. Glad it was a great break! We really had a ball! I can’t wait to see everyone again. But I think I will buy myself shin guards as I am still sporting a hockey stick mark on my ankle and I soccer ball imprint on he knee. Sad thing is both the kids were taking it easy on me. You have to come visit again soon, too! We will open the pool in a couple of weeks.